One more of the Zola commissions. 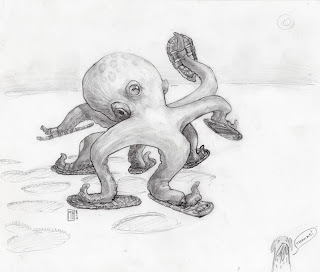 An octopus in snowshoes. Another big thanks to everyone that helped out. We ended up raising just over one thousand dollars, and most of that in the first forty-eight hours. Zola went home last friday, and is doing well. I haven't yet seen her since she got out, but will be sure to take some pictures when I do.